This new Spanish restaurant in Wan Chai has created one huge buzz over the past few weeks. And rightfully so. Its space is gargantuan and it’s been packed since day one (seriously difficult to reserve a spot at the mo). The instant success is, in part, down to its reputation. Its sister restaurant, Catalunya Singapore, has been open for less than a year and it’s already garnered plenty of love from the jet-setting fine dining crowd. The Hong Kong version has the culinary backings of group executive chef Alain Devahive Tolosa, who’s worked alongside the father of modern cuisine, elBulli’s Ferran Adrià, for more than a decade (Adrià himself popped over for the soft opening). Catalunya’s venue is also impressive – with a 5,000sq ft dining room and a 3,000sq ft bar area. Welcome to our city’s latest gastronomic haven. This place is a honeypot for the rich and famous – and it knows it. For one, it’s situated on the unobtrusive ground floor of Oi Kwan Road, where dental centres, flats, hospitals and public pools dwell. There are plenty of places for Beemers to park. Those who are extra cautious about paparazzi can enter through the secret (but not really) VIP back entrance where they can swiftly be ushered into the private dining room. 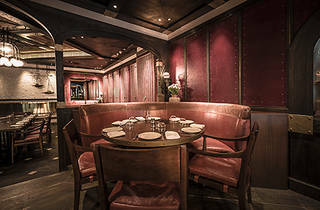 Others who are eager to be gawked at, however, can get comfy at one of the dimly-lit dining rooms’ tables or lounge around the seductive bar near the front entrance. 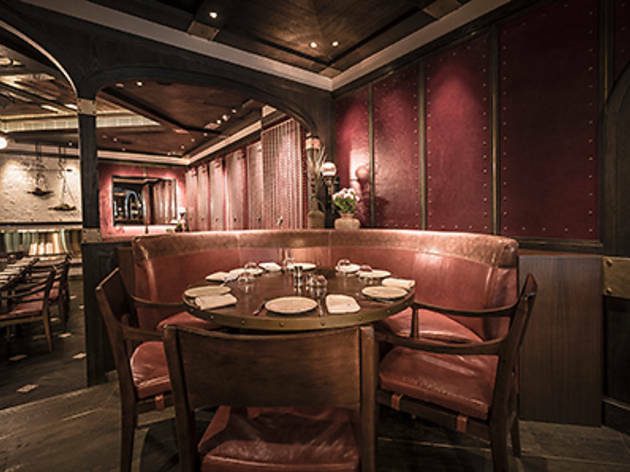 Designed by award-winning New York interior designers AvroKo, sitting inside Catalunya is like being seated inside a giant treasure chest. The walls are blood-red, framed by dark wooden moulding and studded with metal diamond-shaped tacks. You don’t feel like you’re in Hong Kong any more as impressions of Russia, Bali and even New York spring to mind when admiring the décor. The inspiration gained by chef Tolosa when he was at elBulli is apparent in the colourful and quirky modern menu – but the culinary techniques behind the dishes retain the modest traditions of Catalonia, Spain. Take, for instance, one of the restaurant’s bestsellers, the Bikini ($115). It’s basically a glorified ham and cheese sandwich but Catalunya’s combination of Iberian ham, cheese and generous slivers of truffle sandwiched inside two toasted, buttery pieces of bread is ingenious in its simplicity when combined with its rich flavour. The Other Spanish Tortilla ($95) also impresses. It’s not a tortilla at all – instead it arrives in a martini glass as a deliciously thick, creamy, soupy concoction of caramelised onions, egg yolk and potato foam. Our favourite, however, is the Jamon Iberico Croquette ($100) – four deep fried pieces of - surprisingly not mashed potato but rather, velouté and flour - infused with bits of salty ham. The humble dish hits the spot simply by being sinfully creamy and mushy. Other dishes leave less of an amazing impression – but they’re still pretty darn good by usual standards. The velvety smooth avocado and lobster roll ($160) comes all dolled up with green, orange and black caviar balls but the mayonnaise overpowers the subtler ingredients a little and the small portion doesn’t justify its price tag. The suckling pig tapa ($135) is cute to look at – arriving in two cubes – but is a touch on the dry side. And although the Catalunya tomato tartar ($100) is one of the restaurant’s signature dishes – highly touted for its dreamy presentation (half the dish is fluffed up with air and the other half is a chunky tomato stew) – it’s exasperating trying to keep the tartar from slipping through the large holes in the thin, crispy bread. Having picked a few holes, though, wait for the Catalunya fruit salad ($70). This is impressive in thought and presentation, with an array of fruits including pears, star fruit and watermelons infused with other flavours like mint and sangria. It’s a treat for the eyes. The taste can be likened to a fancy fruit cup and is a little unnatural in places – but worth it for the presentation. Catalunya’s menu is way above par and the restaurant’s lively ambience and accommodating service (we get no sour looks from the front desk when we arrive without a reservation and ask to dine at the bar) make it a must-try for Hong Kong foodies. After all, if you’re someone who likes to follow the buzz, you know you were planning on getting a seat at this place anyway. Just be sure to get the croquette. And the tortilla. Oh, and the Bikini as well.